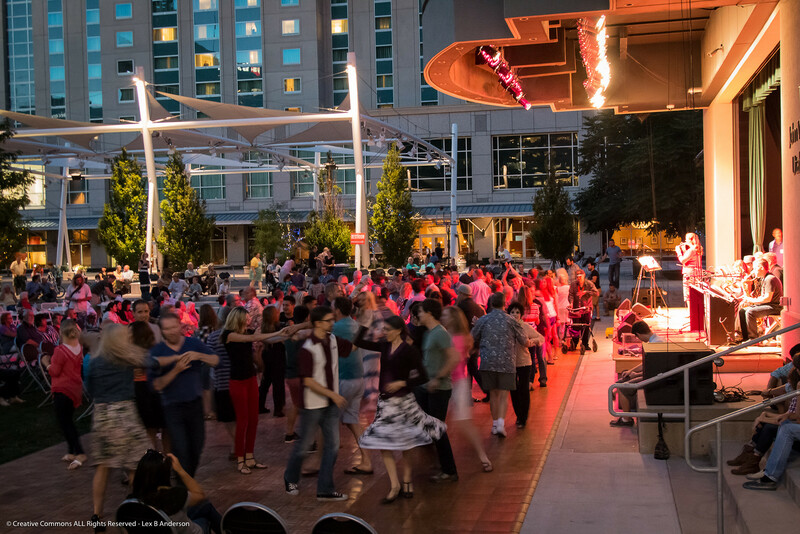 The Gallivan events center is one of our most popular venues. Located in downtown Salt Lake City it is a great place to catch a show and have dinner. The New Paradigm trio performs classical music featuring a violin, viola, and piano. This concert is free and open to the public. Steve Lindeman is a professor of music at Brigham Young University and is one of Utah’s most outstanding pianists. Come out and enjoy this fantastic free, family-friendly concert featuring this wonderful local musician! Aaron Ashton (Violin, Viola, Electric Violin) is the sort of musician who lives in classical, fiddle and ethnic genres with equal ease. The best musicians on the best stage! During summer we have free 30 minute dance lessons before most shows (check schedule for exact dates). All our concerts are free and open to the public! You can bring your own chair or blanket and have a picnic on the grass behind general seating. The Food Truck League sends multiple trucks for each of our shows. Grab some tasty food and enjoy the music! Winter doesn’t hold us back. During the colder, months we move upstairs to Gallivan Hall which is one of the most beautiful indoor venues in Utah. We are happy to say that Excellence concerts held in Gallivan Hall are equivalent to the top Jazz clubs in the world. Come see for yourself! Escape the cold and enjoy music from in one of America’s best Jazz clubs. On the front row you will be inches from the musicians playing.This lets you experience the music on a whole different level! While enjoying a concert you can look out onto the beautiful Salt Lake City skyline. Some footage from a few shows in 2016. This is what Excellence is all about! David Halliday and the Jazz Vespers Quartet playing in Gallivan Hall. The best parking for Gallivan Center events is under the Plaza. Access is on 200 South, between Main and State street. Important note: this parking entrance can only be accessed if you are eastbound on 200 South. In practical terms, this means you must turn East onto 200 South from either West Temple or Main Street. Event parking is about $5.